You are at:Home»Herbs»Cichorium intybus Linn. Latin name : Cichorium intybus Linn. Description : It is a prolific plant that thrives in places where nothing else will grow. 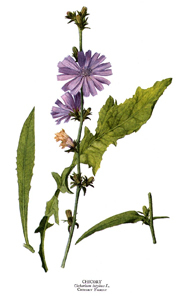 Galen, the second-century physician-herbalist, called chicory a “friend of the liver.” The seeds, leaves and root have cardiac, carminative, cordial, depurative, digestive, hypoglycemic, laxative and tonic properties and are useful as a brain tonic and for headache, asthma and bilious vomiting. It is an acclaimed hepatoprotective and, is used in hepatic enlargement, sluggishness, jaundice, fever, vomiting and abdominal pain. Cleanses the urinary tract. It can lower pulse rate and reduce cholesterol levels. It has cholagogue and antiinflammatory properties and is useful in rheumatic condition and gout. Checks bilious enlargements of the spleen with general oedema. It contains 45-60% inulin, a phytochemical that bucks up the immune system and also which can lower levels of blood cholesterol. It increases basal metabolism, which must be the reason why it is a favourite drink amongst students and hard workers. It acts on the central nervous system and heavy doses can generate giddiness and sleep. It is proven to be an instant energiser, which is why it is recommended in the convalescence stage i.e. the period of recovery after the termination of a disease or an operation. Women who suffer from premenstrual syndrome (PMS) may find that regular use of chicory root as a bitter and a liver tonic may assist in maintaining hormone balance and lessening the symptoms of PMS. Chicory also supports the body’s ability to absorb calcium, a nutrient that helps build and maintain strong teeth and bones. The inulin encourages the growth of bacteria needed for the intestines to work properly. Chicory, therefore, can help to prevent and treat problems such as sluggish digestion, gastric ulcers and flatulence. Recommended Dosage : Seeds, Leaves and Root : 7 g powder. Contraindication : This herb is contraindicated during pregnancy or lactation.